O2 have been a major force in sponsorship since the brand was launched in 2002. From its earliest days O2 has put sponsorship at the heart of both its retention and acquisition strategies. They have always adopted a two pronged approach delivering sponsorship benefits and great customer experiences across both sport and entertainment, all linked together under the “Priority” proposition. AEG and O2 with the announcement of The Naming Rights sponsorship of the previous millennium dome marked a new era in sponsorship. Innovation and creating unique customer experiences are at the heart of this partnership. Launched in 2007 the partnership offers O2 customers the opportunity to buy tickets up to 48 hours before they go on sale to the public. 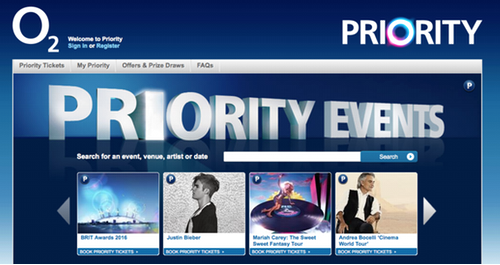 Econometric modelling demonstrated that The O2 and Priority Tickets worked harder that any other campaigns at driving brand consideration and recommendation. AEG’s relationship with O2, is a true partnership as both have the same objective – putting the customer first. The teams jointly looking to drive innovation in sponsorship creating activity on site and in the digital space which is designed to enhance the experience for each every visitor to The O2. The latest example of this was the Wear the Rose campaign. The O2 acted as the backdrop and the spring board for O2’s 2015 England Rugby campaign. The iconic roof was transformed into a giant projector and the venue hosted a huge concert featuring the team and Take That. A great example integration and leveraging multiple sponsorship assets to achieve maximum effect.